Which Is Cheaper : FHA Or Conforming 30-Year Fixed? FHA Mortgage Rates Vs. Conforming Mortgage Rates : Which Are Cheaper? The FHA insures 25% of the mortgage purchase market these days, up from 5% in 2006. It’s not just because of low rates. The FHA offers a terrific mortgage product. The FHA offers a 30-year fixed rate mortgage. So does Fannie Mae and Freddie Mac. However, people tend to assume that these mortgages are alike; that a 30-year fixed is a 30-year fixed is a 30-year fixed. It’s not. That would be like saying a car is a car is a car. Beyond their 30-year amortization schedules, the 30-year fixed rate mortgage products from the FHA, and from Fannie and Freddie are hardly similar. Some of the difference are marked. FHA mandates mortgage insurance on all loans. Fannie and Freddie do not. FHA mortgage insurance lasts 60 months no matter what. Conforming mortgage insurance lasts until there’s 20% equity in the home. FHA mortgages can be assumed by a subsequent buyer. Conforming mortgages can’t. Conforming mortgages require loan-level pricing adjustments. FHA loans do not. And, lastly, the FHA requires a minimum downpayment of 3.5% on a purchase. Fannie and Freddie want to see 5 percent, at least; oftentimes, 10 percent. Another big difference between FHA and conforming mortgages is how they’re priced. Because FHA and conforming mortgages flow to Wall Street through different channels, their mortgage rates are never identical. Some days FHA rates are cheaper. Some days, they’re not. Today, conforming loans beat FHA by roughly 30 basis points, or 0.30 percent. Which Is Better : FHA Or Conforming 30-Year Fixed? So which is better? 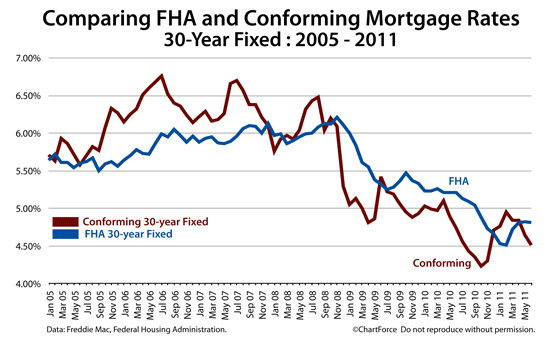 FHA or Conforming? It depends on your individual situation and you have to do the math to know for sure. For example, if you’re HARP-eligible on a refinance, equity can be irrelevant and conforming is the way to go. Or, if you’re buying on the HomePath program, you can’t go FHA. Furthermore, because of loan-level pricing adjustments, credit scores must figure into the math, too. Compare Your Own Loan : FHA or Conforming? To know whether you’re best served with an FHA loan or conforming one, you need to see what it looks like on paper. Consider your rates, your costs, and any add-on fees such as mortgage insurance.